Who will prevail as Bournemouth take on European hopefuls Wolverhampton Wanderers at the Vitality Stadium? Today's three o'clock kick off could be a case of an unstoppable force meeting an immovable object. In this case, the unstoppable force is the constant rise of Nuno Espirito Santo's Wolverhampton Wanderers, and the immovable object is Bournemouth's incredibly reliant home record. After losing two consecutive away games, Eddie Howe will be glad to return home where he knows his side can put in a strong performance. The Cherries have scored in all but two of their home games this season, and should they pick up three points today, they will move in to the top 10 once again. Wolves are however still chasing that elusive European spot, and with their rivals Watford pulling out an emphatic 5-1 win over struggling Cardiff City, the Wanderers will be desperate for a win this afternoon. With both sides in such great respective form, there would be no surprise if it was a game that breeds goals. This Bournemouth side has shown that it can score goals at home all season, last time they were at home - back in January - they put four past Chelsea in just 45 minutes. Although Wolves are known for their tight defence, in six of their last seven Premier League games, they have let in at least one goal - just to keep their fans on edge. To emphasise the well-drilled nature of the Cherries, they have only been behind at half time once this season at the Vitality. Alongside this fact, Eddie Howe's men have also gone on to win each of the five games that they led at the break. The majority of the action, however, does seem to arrive in the second half though. In Bournemouth's last five Premier League games there have been 13 goals scored, 10 of which have come after the stroke of half time. So the advice to fans would definitely be, stick around for the final whistle. Back in December Wolves came out superior against Bournemouth in their coming together at Molineux. 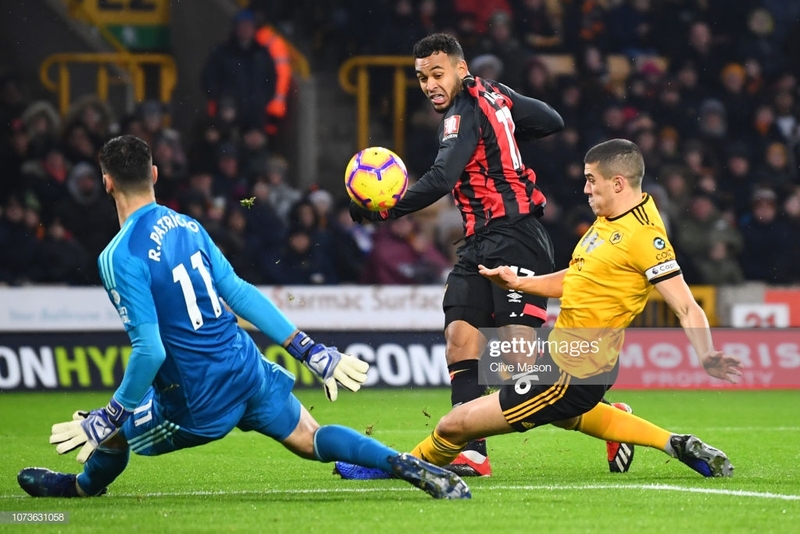 The game highlighted the way that Wolves like to play their matches, Bournemouth kept possession, while the Wolves sat back and waited to pounce. The tactic worked, and it worked twice. Mexican forward Raul Jimenez got the opener in the 12th minute, and from then on, the home side had something to hold on to. They dug their claws in until they got their chance to rub salt in the wound in the 94th minute through Ivan Cavaleiro to make it 2-0. I wouldn't be surprised to see much more of the same this afternoon. Two very well drilled sides who play with contrasting tactics, both capable of getting the better of the other. It's groundhog day for the travelling side as undoubtedly the one to keep an eye on, and the player you would fancy for your fantasy side is Raul Jimenez. The number nine has now scored three in his last three Premier League outings, taking his tally up to nine. If the Mexican loanee scores this afternoon he will go level with Sylvain Ebanks-Blake as the fourth highest goalscorer in Wolves' Premier League history. Unfortunately for Bournemouth many of their usual suspects are still out through injury. However, Norwegian winger Joshua King has recently stepped up to his mark and has now bagged three times in his last two appearances. As mentioned, Bournemouth are still without many of their main men. Key figures including goalscorer Callum Wilson and young prodigy David Brooks are still sidelined for the Cherries. Reliable winger Junior Stanislas is also awaiting a check up on a thigh problem. In brighter news for Bournemouth, left-back Charlie Daniels will make a return after being left out of the squad against their loss against Liverpool for personal reasons. Fellow full-back Nathanial Clyne is also available. There are very few injury concerns over in the Wolves camp, however, inform, Diogo Jota is said to be ready for a return following a dead leg that forced him out of the cup tie against Bristol City. Ruben Neves was only a substitute in that game so he will most likely be in today's starting XI. Finally, there was a slight scare for full back Matt Doherty as he limped off in that win at Ashton Gate. However, it has been made apparent that the right-back is fit to play in this matchup. Bournemouth: Begovic, Clyne, Cook, Aké, Smith, Ibe, Gosling, Surman, Fraser, King, Solanke. Wolves: Ruí Patricio, Doherty, Bennett, Coady, Boly, Jonny, Dendoncker, Neves, Moutinho, Jimenez, Jota.